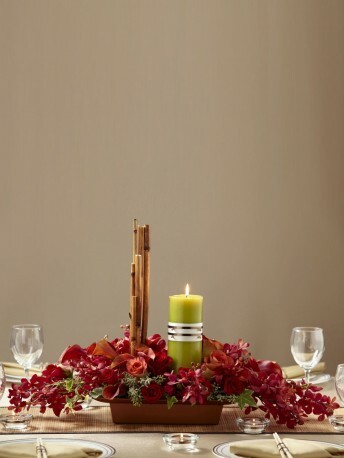 This beautiful centrepiece has an alluring elegance that will make your wedding celebration stand out from the rest. Red mokara orchids, mango mini calla lilies, red roses, Leonidas roses, variegated ivy, seeded eucalyptus and curly willow tips are brought together to form an exquisite arrangement offset by a green pillar candle and river cane stems for a display of dramatic sophistication. Approx. 18"H x 30"W.